Stephen Frasier is a Professor and Co-Director of MIRSL. He received the B.E.E. degree in 1987 from the University of Delaware, Newark and the Ph.D. degree in 1994 from the University of Massachusetts, Amherst. His graduate work involved the development of a phased-array imaging radar for oceanographic research applications. Since 1994, he has been employed by the University of Massachusetts as a Research Engineer, Senior Research Fellow, and as a faculty member. His research interests include microwave imaging and interferometric techniques, radar oceanography, and radar meteorology. Dr. Frasier is a Senior Member of the IEEE Geoscience & Remote Sensing Society and a member of the International Union of Radio Science (URSI) Commission F, the American Geophysical Union, and the American Meteorological Society. 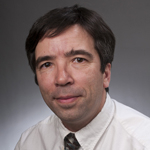 Paul Siqueira is a Professor and Co-Director of MIRSL. He received the Ph.D. in Electrical Engineering from the University of Michigan's Radiation Laboratory in Ann Arbor, and a Bachelor's and Master's degree in Electrical Engineering from Iowa State University in Ames, Iowa. Prior to arriving at the University of Massachusetts, Professor Siqueira worked in the Radar Science and Engineering Section at the NASA's Jet Propulsion Laboratory, run by the California Institute of Technology in Pasadena, California. Prof. Siqueira's research interests are in radar interferometry, polarimetry, micro- and millimeter-wave instrument development, and remote sensing science for terrestrial applications. Mario Parente is an Assistant Professor. He earned B.S. and M.S. degrees in telecommunications engineering from the University of Federico II of Naples, Italy, and he earned M.S. and Ph.D. in Electrical Engineering from Stanford University. Prior to joining MIRSL, he was a post-doctoral research associate at Brown University. Dr. Parente's research interests include hyperspectral imaging, sensors and data analysis, and machine learning techniques for determining ground composition and detecting geomorphological features. He is a member of the NASA Compact Reconnaisance Imaging Spectrometer for Mars (CRISM) and the Moon Mineralogy Mapper (M3) research teams. Michael Zink is an Assistant Professor. He received his Diploma (M.Sc.) from the Darmstadt University of Technology in 1997. From 1997 to 1998 he was employed as a guest researcher at the National Institutes of Standards and Technology (NIST), where he developed an MPLS testbed. In 2003 he received his Ph.D. degree (Dr.-Ing) from Darmstadt University of Technology. He works in the fields of sense-and-response sensor networks, distribution of high-bandwidth, high-volume data, and the design and analysis of long-distance wireless networks and Systems Engineering. Further research interests are in wide-area multimedia distribution for wired and wireless environments and network protocols.